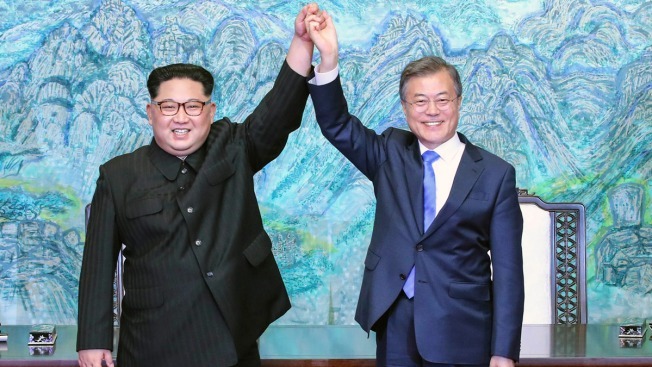 This April 27, 2018, file photo, shows North Korean leader Kim Jong Un, left, and South Korean President Moon Jae-in raising their hands after signing a joint statement at the border village of Panmunjom in the Demilitarized Zone, South Korea. North Korea readjusted its time zone to match South Korea’s on Saturday and described the change as an early step toward making the longtime rivals “become one” following a landmark summit. North Korea readjusted its time zone to match South Korea's on Saturday and described the change as an early step toward making the longtime rivals "become one" following a landmark summit. North Korean leader Kim Jong Un promised to sync his country's time zone with the South's during his April 27 talks with South Korean President Moon Jae-in. A dispatch from the North's Korean Central News Agency says that promise was fulfilled Saturday by a decree of the nation's Presidium of the Supreme People's Assembly. The Koreas used the same time zone for decades before the North in 2015 created its own "Pyongyang Time" by setting its clocks 30 minutes behind South Korea and Japan. It said at the time that it did so to root out the legacy of Tokyo's 1910-1945 colonial rule of the Korean Peninsula, when clocks in Korea were changed to be the same as in Japan. "Pyongyang Time" was created as tensions between the authoritarian country and the U.S. grew over Pyongyang's nuclear weapons program and international sanctions aimed at dismantling it. But in recent months relations between the Koreas have warmed dramatically, with Kim and Moon pledging at their summit to rid their peninsula of nuclear weapons. 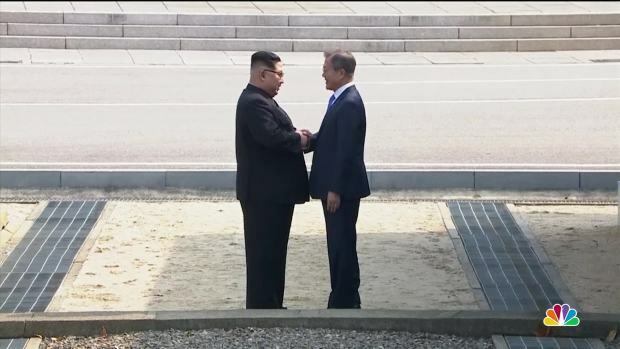 The meeting produced many steps toward reconciliation, including an agreement to resume reunions of families separated by the 1950-53 Korean War, though it lacked a breakthrough in the nuclear standoff. Those details await Kim and President Donald Trump, who are expected to meet in the coming weeks. KCNA earlier said Kim proposed returning North Korea to the South's time zone because it was "a painful wrench to see two clocks indicating Pyongyang and Seoul times hanging on a wall of the summit venue." The news agency said resynchronizing North and South Korean time was "the first practical step" since the summit "to speed up the process for the north and the south to become one and turn their different and separated things into the same and single ones." According to South Korea, Kim has said he'd be willing to give up his nukes if the United States commits to a formal end to the war and pledges not to attack the North. But his exact demands for relinquishing weapons that his nation spent decades building remains unclear.